Another 15 wins & 24 nominations. I've always felt that when you fictionalize a story about war, you dishonor the memory of so many people who have a compelling story to tell by choosing to make something up instead *cough*privateryan*cough*. The problem with war movies about real people is that you have to deal with complexities of character and plot that the genre simply doesn't lend itself easily to. So when the story at hand aims to pose questions like "what does it mean to do the wrong things for the right reasons" and tries to debunk the popular myth of herodom, there's very little margin for error. Enter Clint Eastwood. Never one to shy away from challenging stories, this is a much bigger effort than his usual understated character dramas. On the one hand, it doesn't "feel" like a Clint Eastwood movie, but on the other, it feels at home in his themes of used-up heroes -- the person behind the larger than life persona. These are complex characters in very difficult situations, and he presents them in a way that's straightforward and non-judgmental, so we're left to decide the answers to the film's central conflicts ourselves. To a person, the cast is up to the challenge. It's hard not to admire Ryan Phillippe for a restrained and thoughtful performance, but the real kudos go to Adam Beach. Almost every aspect of Beach's character is cliché, with one minor exception - that's really the way Ira Hayes was. So the challenge was to portray Hayes as a real person despite the cliché, and the result is one of the most heartbreaking and troubling performances in the film. Here's a guy who is portrayed as a hero, who really has no answers at all. There's a lot not to like about the film. It's not "entertaining" per se, in the same way that any war memorial in DC is not entertaining. Nor is it a particularly approachable film. What it lacks in popcorn-munching entertainment value, it replaces with gravitas. This is an important film, about an important time. It's status as a valuable history lesson is secondary to it's reflections on human nature and our society. As such, it deserves to be seen, and contemplated, and appreciated. I can't wait for Letters From Iwo Jima (the companion piece, also from Clint Eastwood, told from the Japanese point of view.) Taken together, the scope of this project is breathtaking. 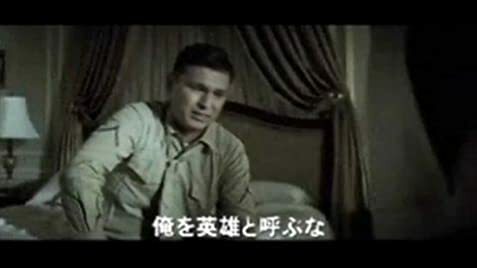 Actual Marines from the 5th Marines were used as extras during filming aboard ship as well as the the training work up. The extras who were actual Marines can be best seen climbing up and down the cargo nets. Soldiers: Corpsman! Corpsman! Corpsman! Corpsman! For God sakes, corpsman! Corpsman! Corpsman! Rene Gagnon's hand movements while playing the guitar do not match the music at all. There is an additional short sequence after the credits have ended.